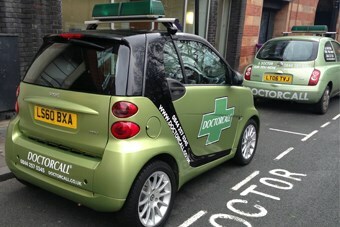 Our superb visiting doctor service is now available in Manchester. There is no need to be registered or to have used us before. Our rapid service aims to have a doctor with you quickly. Experienced private GPs can visit you at your home, hotel or office. You can choose a time or ask for the doctor to attend as soon as possible. We can arrange for a doctors visit for both private individuals and companies. If you wish to arrange for a doctor to visit you, your client or employee you can do so online, or call our team now. Our visiting GP London service is designed so you get a doctor when you want, where you want. To arrange a private visiting GP, call us, email us or book one using our online facility. Doctorcall has a well-established presence in Manchester - our private clinic in St. Ann's Square has been open for over ten years. Our visiting doctor service means you don't need to take the time out of your day to come and see a GP, we will come to you. Our visiting GPs carry medication meaning you can often start the treatment you need right away. We can also offer prescriptions, referrals and rapid tests without the need to make an appointment at a clinic. Payment can be made using your credit or debit card. We also welcome payments from company cards. Frequent users or companies may wish to enquire about paying on account. Doctorcall of Harley Street brings its 27 years of experience as the UK’s original and leading private GP visiting service to the homes, hotels and businesses of Manchester.